The Banff to Victoria Golf Safari – Peaks to the Pacific, golf vacation takes you from the Snow Capped mountains of Banff in the Canadian Rockies to the Oceanside courses of Victoria on Vancouver Island. It is built around one single premise: Play only the absolute best courses in only absolutely unforgettable scenery. 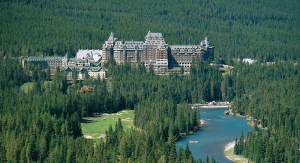 You simply cannot find a better golf vacation anywhere in Canada. Protected by UNESCO as World Heritage Sites, Banff and Jasper are living reminders of the awe-inspiring beauty of nature. Kelowna in the Okanagan Valley features warm dry weather, thirty golf courses, innumerable wineries and over one-hundred kilometers (sixty-two miles) of beautiful lakes. Vancouver: what about a sunset from a mountaintop restaurant, or browsing the trendy shops along Robson Street? Or take a trolley tour of historic Gastown, walk the dizzying heights of the Capilano Suspension bridge, escape the crowds with an afternoon in a Stanley Park or relax over a fantastic meal in one of Vancouver’s over 10,000 restaurants offering cuisine from every corner of the globe. Then drive up the Sea-to-Sky Highway to your next destination. With its incredible blend of snowcapped mountains, world-class resorts and superb courses by Jack Nicklaus, Robert Trent Jones Jr. Arnold Palmer and Robert Cupp it should come as no surprise that Whistler has been named as the Top Golf Resort destination in Canada and one of the Top Twenty Golf Destinations in the World by Golf Digest Magazine. Your final destination is Victoria. Multiple winner of Conde Nast Magazine’s “ Best City in the Americas” award and home to some truly incredible courses the bucket list will be more filled after completing this trip! All packages can be shortened or customized to suit your needs. Call us toll free at 1-866-723-2747 with your questions, to book or to request other package options! We had a fabulous trip and the arrangements were perfect. Thank you so much.